The need for a new, higher-density, less-costly, more-stable data storage solution is acute; Worldwide, data is being generated at a rate much faster than it can be stored. This deficit is accelerating such that, by 2020, it is estimated there will be a 7.5 zettabytes (7.5 trillion gigabytes) gap of unstorable data. That’s about two billion large hard drives worth of data! This gap will continue to grow until a technological leap in data-storage technology occurs. Over the last 3.8 billion years, mother nature has optimized DNA as the ultimate long-term, high-fidelity, high-density data storage tool. Recent reports of the full recovery and sequencing of ~700,000-year-old horse genome highlight the long-term stability inherent to DNA. Further, DNA presents an incredibly dense storage medium; the DNA in a single human cell encodes roughly 24 gigabits of information, as much data as an hour-long HD video stream! 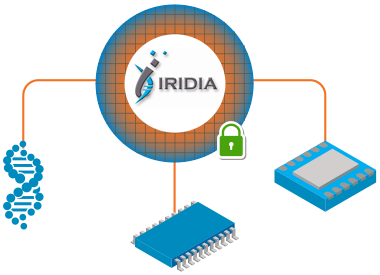 Iridia was established in 2016 to develop the world’s first commercially-attractive, DNA-based data storage solution. By combining DNA polymer synthesis technology, electronic nano-switches and semiconductor fabrication technologies, Iridia is developing a highly-parallel format to enable an array of nanomodules with the potential to store data at exceptionally high density.